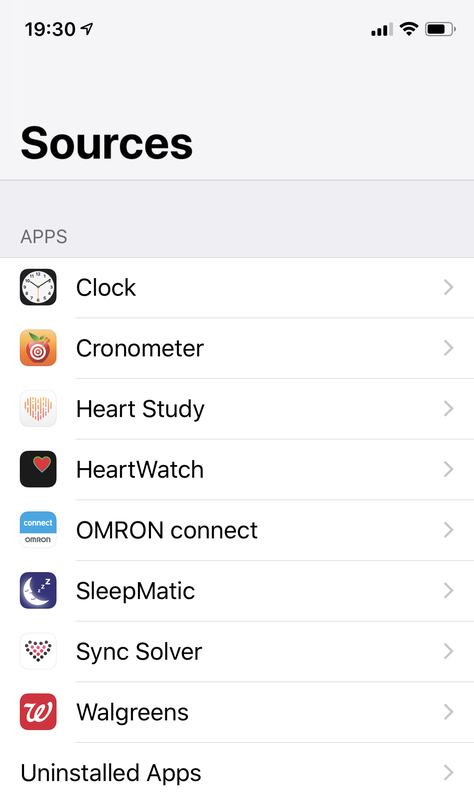 Apple health got confused when I switched to the beta app. Then, after I deleted the app store version, it got confused on a different way. (Notes... In that first screenshot (below) I saw the switch turn off on the top instance when I opened Health right after I deleted the second app, but the second switch stayed on. In the second screenshot, note that only one version shows up as deleted (not sure what's up with the icon but that seems to be Apple). In the third, Chronometer (one version, not sure which) shows up as "inactive". It was actually doing that before I deleted the first app which is what got me started down this hole.